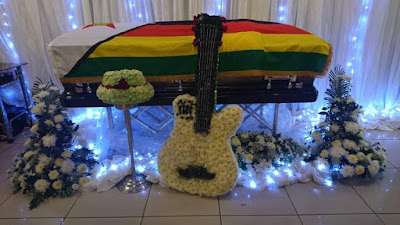 NATIONAL hero Dr Oliver Mtukudzi will be buried tomorrow (Sunday) at his rural home in Madziva. The international music icon died at the Avenues Clinic in Harare on Wednesday after battling diabetes. President Mnangagwa declared Dr Mtukudzi a national hero on Thursday. Government has provided 43 buses to ferry the mourners to Madziva on Sunday morning. Addressing journalists in Harare yesterday, Minister of Information, Publicity and Broadcasting Services Monica Mutsvangwa said 30 buses will ferry people from Harare. “As a sign of love, we are encouraging Zimbabweans to come out in their numbers and attend the burial in Madziva. As Government, we have come up with 30 buses for Harare, so that those who would want to join the mourners can do so. These 30 buses will leave for Madziva on Sunday morning. “There are five buses organised to ferry people from Mashonaland West while five others have been set aside for Mashonaland Central. There will be one bus for each of the remaining provinces,” said Minister Mutsvangwa. The Mtukudzi family was allocated two buses. Minister Mutsvangwa said the Harare buses will depart for Madziva on Sunday morning ahead of the burial at 2PM. Today, the body of the national hero leaves his Norton home at 8AM for Pakare Paya Arts Centre where a church service will be held. By 12 noon, the funeral procession departs for the National Sports Stadium where various artists will be performing live. “Tomorrow, 26 January 2019, a church service will be held at Pakare Paya at 9am. Body viewing will be held there. “The National Arts Council in conjunction with other stakeholders has organised a concert in honour of our late national hero which will be held tomorrow at the National Sports Stadium,” said Minister Mutsvangwa. The hearse will leave for One Commando barracks. Helicopters will take off for Madziva around 3.30pm. The body will lie in state before burial on Sunday afternoon. Minister Mutsvangwa said those who cannot make it to Norton can just go straight to the National Sports Stadium where the gates open at 9AM. “We expect people to be going to Pakare Paya for the church service but some can even go straight to the National Sports Stadium where musicians start entertaining people as early as 9am,” she said. Minister Mutsvangwa said Zimbabwe had lost a unifier.